Milwaukee loves the Oak Leaf Trail, a 125-mile escape to nature connecting the major Milwaukee County parks. But many have not heard the history behind the trail. Believing parks to be the “lungs of the people,” long-range thinkers like Charles Whitnall advocated for the verdant spaces the trail would later snake through. To promote biking as an alternative to precious gasoline during wartime, Harold “Zip” Morgan designed a route that 1960s riders built on. Years later, bicycling enthusiasts worked overtime with local leadership to get a 76-mile route ready for the country’s bicentennial, creating the beloved 76 Bike Trail. The Oak Leaf story continues today as local volunteers and politicians advocate for extensions, repairs and other improvements. Join local author Jill Rothenbueler Maher as she uncovers the previously untold stories of a Milwaukee County treasure. Jill Rothenbueler Maher grew up jogging, biking and cross-country skiing with her family in southeast Wisconsin. After moving to Washington, D.C., she enjoyed the Washington and Old Dominion Trail and logged countless hours training for duathlon races. Back in Milwaukee, she enjoys sunrise runs and Saturday rides with friends on the Oak Leaf Trail. She regularly writes for the Bay View Compass and has degrees from the University of Minnesota and Georgetown University. 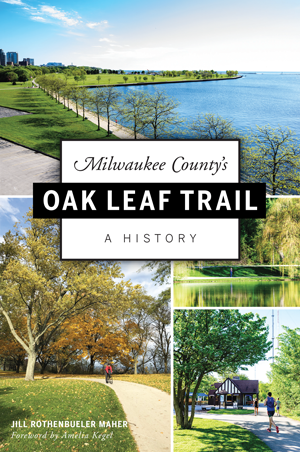 Milwaukee County’s Oak Leaf Trail is her first book.